Hypothyroidism, or an underactive thyroid gland, is usually cause by an autoimmune process in which the body inappropriately attacks its own thyroid gland as if it were foreign tissue. 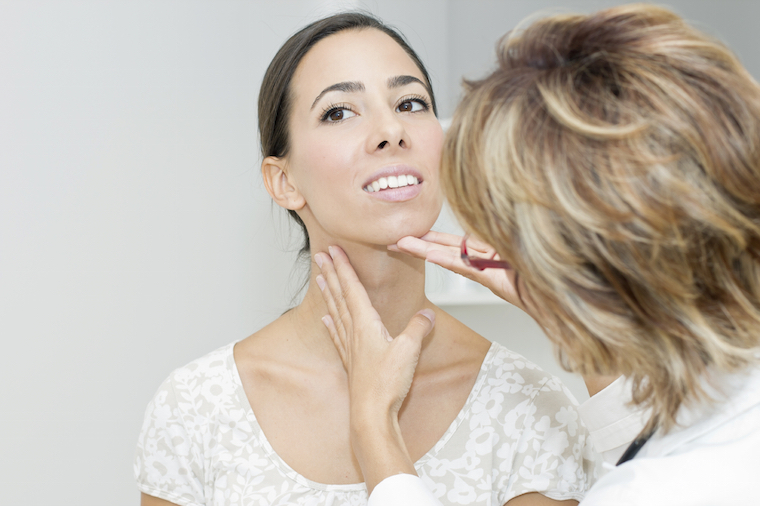 Autoimmune hypothyroidism is called Hashimoto's hypothyroidism. The underlying cause of the autoimmune process is not known exactly - Hashimoto's thyroiditis tends to occur in families, can be associated with other autoimmune conditions such as type 1 diabetes or coeliac disease and is 5 to 10 times more common in women than in men. Hypothyroidism can be easily and completely treated with thyroid hormone replacement but many patients also ask what lifestyle changes they can make to help themselves. There are several studies that show a strong connection between autoimmune thyroid disease (which can cause hypothyroidism or hyperthyroidism) and gluten intolerance. It is hypothesised that the problem is that the gliadin portion of gluten looks similar to thyroid tissue, so if gut permeability is so compromised that gliadin enters the bloodstream, the immune system tags it for destruction – and in turn also destroys thyroid tissue. The link between gluten intolerance and thyroid disease is such that the guidelines state that all patients with autoimmune thyroid disease should be screened for Coeliac's disease. However, even if a test for Coeliac's disease comes back negative, there may still be some degree of gluten intolerance and in my view it is worth a trial of gluten exclusion for at least a month to see if you feel generally better or any of your symptoms improve. The immune response to gluten can last a significant amount of time after you eat it, so be thorough with exclusion for one month to see if this has an impact on the way you feel. This is safe to do. Many of my patients find cutting out gluten reduces inflammation in the joints and improves skin conditions or mood, so cutting gluten out may improve other symptoms that you didn’t realise were related. Other foods that have been linked with gut inflammation are cereal grains, cow's milk casein, soy, peanuts and nightshade vegetables such as tomatoes, eggplants and peppers. Taking selenium 200mcg per day for 3 months may reduce the inflammatory activity in autoimmune thyroid disease. If you suffer from bloating and digestive issues, it is important to know that low thyroid function is often associated with low stomach acid. Adequate stomach acid is necessary for your digestive enzymes to work optimally. It is worth checking levels of the trace elements that may not be absorbed as well in situations of low stomach acid. Check your iron levels, which should be in the upper third of the normal range. Being hypothyroid can result in a lowered production of stomach acid, which in turn leads to the malabsorption of iron. Additionally, being hypothyroid can cause heavy periods, which causes more iron loss. Moreover, iron is needed to convert T4 (thyroxine, which is most of what the thyroid gland produces) to its more active form T3 (triiodothyronine, which is the most metabolically active thyroid hormone). Good iron levels are needed to make enough adrenal hormones. If your iron is normal, check your ferritin (a marker of iron stores ) which should be above 70. Ferritin levels of below 70 can contribute to symptoms such as hair loss, so if the ferritin is low take a gentle iron supplement such as spatone. Iron, in addition to selenium and zinc, is essential for normal thyroid hormone metabolism. Check B12 levels: again these can be low due to low stomach acid production. An optimal B12 blood result is in the upper quarter of the normal range. When supplementing with B12, the methylcobalamin version is considered the most active and absorbable, thus the most recommended. Check folate levels : Folate levels can be low in hypothyroidism. Good dietary sources of folate include vegetables such as romaine lettuce, spinach, asparagus, broccoli, cauliflower and lentils. Check Magnesium: thyroid patients can be chronically low in the electrolyte magnesium. Check vitamin D levels: vitamin D helps regulate the immune system, and a number of hypothyroid patients are vitamin D deficient. For the inflammation associated with autoimmune thyroid disease, an anti-inflammatory Mediterranean diet and consumption of foods such as turmeric and ginger is ideal. Selenium supplementation in patients with autoimmune thyroiditis decreases thyroid peroxidase antibodies concentrations.